HER2 mutations V777L, D769H, V842I, G309A induce gain-of-function over HER2 WT in MCF10A mammary epithelial cells. 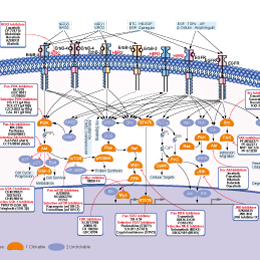 B, HER2 WT, L755S, and del.755–759 cells were grown in Matrigel in the presence of DMSO vehicle (0.5%), neratinib (0.5 μmol/L) or gefitinib (0.5 μmol/L). Phase contrast images were obtained as in A. C, MCF10A-HER2 WT or mutants were seeded in soft agar. After 7 days of growth, they were treated with DMSO vehicle (0.5%), lapatinib (0.5 μmol/L) or neratinib (0.5 μmol/L) for an additional week. Error bars represent 95% highest posterior density intervals. *, Significant difference between the HER2 mutant and HER2 WT; #, the effect of inhibitor treatment was significant (95% highest posterior density interval did not contain 0 for both). D, photomicrographs of the colonies in soft agar on day 12, magnification ×40. Cancer Discov 2013 3, 224-37. Neratinib (HKI-272) purchased from Selleck. Differential sensitivity of EGFR-mutant glioma and lung cancer cell lines to the irreversible EGFR inhibitors HKI-272 and CI-1033. C, HKI-272 is more potent than CI-1033 in blocking EGFR phosphorylation in SKMG3 cells with EGFR EC mutation. SKMG3 cells were treated with the indicated doses of CI-1033 or HKI-272, and whole lysates were analyzed by immunoblot with the indicated antibodies. Cancer Discov 2012 2, 458-471. Neratinib (HKI-272) purchased from Selleck. Differential sensitivity of EGFR-mutant glioma and lung cancer cell lines to the irreversible EGFR inhibitors HKI-272 and CI-1033. A, HKI-272 induces cell death in GBM cells with EGFR EC mutation (SKMG3, SF268) but not EGFR wild-type (WT EGFR) cancer cell lines or astrocytes (NHA). Cell death was assessed by trypan blue exclusion after 5 days of inhibitor treatment. Cells lines in black express wild-type EGFR, whereas those in red contain EGFR EC mutations. (C, D) Cells were treated as mentioned above for the indicated times and processed for immunofluorescence experiments with anti-ErbB2 antibody (green). Nuclei were stained with DAPI (blue). Examples of intracellular ErbB2 punctae are indicated with yellow triangles. Scale bar = 10 μm. Cancer Lett, 2016, 382(2):176-185. Neratinib (HKI-272) purchased from Selleck. Oncotarget, 2016, 7(36):58038-58050. Neratinib (HKI-272) purchased from Selleck. Western blot analysis of EGFR, pEGFR, HER2, pHER2, HER3, pHER3, HER4 and pHER4 in parental and neratinib-resistant cells following treatment with 1M neratinib for 2h. Actin was probed as loading control. Biochim Biophys Acta, 2018, 1865(8):1073-1087. Neratinib (HKI-272) purchased from Selleck. Neratinib is prepared as 10 mg/mL stocks in DMSO and diluted in 25 mM HEPES (pH 7.5; 0.002 ng/mL-20 μg/mL). Purified recombinant COOH-terminal fragments of HER2 (amino acids 676-1255) or epidermal growth factor receptor (EGFR) (amino acids 645-1186) [diluted in 100 mM HEPES (pH 7.5) and 50% glycerol] is incubated with increasing concentrations of Neratinib in 4 mM HEPES (pH 7.5), 0.4 mM MnCl2, 20 μM sodium vanadate, and 0.2 mM DTT for 15 minutes at room temperature in 96-well ELISA plates. The kinase reaction is initiated by the addition of 40 μM ATP and 20 mM MgCl2 and allowed to proceed for 1 hour at room temperature. Plates are washed, and phosphorylation is detected using Europium-labeled anti-phospho-tyrosine antibodies (15 ng/well). After washing and enhancement steps, signal is detected using a Victor2 fluorescence reader (excitation wavelength 340 nm, emission wavelength 615 nm). The concentration of Neratinib that inhibits receptor phosphorylation by 50% (IC50) is calculated from inhibition curves. Method: Cells are exposed to various concentrations of Neratinib for 2, or 6 days. Cell proliferation is determined using sulforhodamine B, a protein binding dye. Briefly, cells are fixed with 10% trichloroacetic acid and washed extensively with water. Cells are then stained with 0.1% sulforhodamine B and washed in 5% acetic acid. Protein-associated dye is solubilized in 10 mM Tris, and absorbance is measured at 450 nM. The concentration of Neratinib that inhibits cell proliferation by 50% (IC50) is determined from inhibition curves. Rabindran SK, et al. Cancer Res, 2004, 64(11), 3958-3965. CP-724714 : HER2/ErbB2-selective, IC50=10 nM. Mubritinib (TAK 165) : HER2/ErbB2, IC50=6 nM. Lapatinib : Approved by FDA for breast cancer. 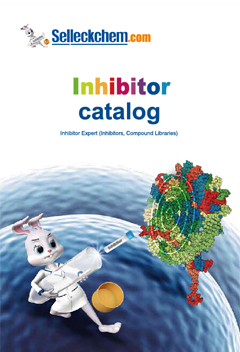 Lapatinib (GW-572016) Ditosylate : Dual EGFR/ErbB2 inhibitor, IC50=10.8/9.2 nM.